Go Green! 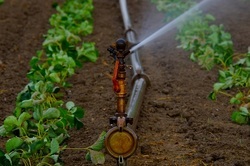 Irrigation uses natural resources to water your yard. Knoxville Landscaping Company will assess your landscape, design, install and advise you on the best watering system for your landscape, with the best controls, heads, layout, timing and of course best maintenance. We've assembled some information on sprinklers, lawn care and mindful watering to help you take care of your turf. Careful design. When we engineer the sprinkler system for your lawn and garden, we will do so taking into consideration the hardscapes and other things that don't need to be watered. A lot of companies don't take this into consideration, they irrigate your lawn and that is it, but here at Knoxville Landscaping Company we put careful planning into the irrigation or sprinkler system we design and install in your yard. Using just enough! Overwatering is just as much of a problem as under-watering. Using a little less water than your plants can handle to yield a heartier plant. In the long run this means less expense and upkeep for you and more beautiful plants for your landscape. Also, overwatering and running the sprinkler more than necessary can result in runoff. If you don't have a french drain installed, runoff leads to damage to the foundation of your home. The use of greywater. Ask us about greywater systems, often used with micro irrigation just below the surface of the soil. Using your greywater from showers and sinks, after it has passed through a filtration system, is a great way to minimize overusing potable water. Extremely sustainable! Season to season we will change how often your lawn is watered using the controls. It is the best to water your plants in the early morning. Watering in the late morning can lead to disease due to the dew. Dew typically burns off in the morning sun and the grass undergoes a period of relative outer dryness during which it absorbs sunlight and carbon dioxide. If it stays waterlogged for too long, it weakens the organic fibers of the grass and allows for bacteria to further break down the plant structure. Watering in late morning or afternoon is not recommended. In the summer, you'll probably need to water the lawn more frequently than in the winter. By keeping an eye out for dry patches (or paying us the affordable cost to do it for you!) we can keep the lawn healthy no matter the weather, no matter the season. Regular checks and maintenance. Even a perfect sprinkler installation will need cleaning up from time to time. Especially if you want it run flawlessly, distributing the water evenly across your garden. Consider gathering rainwater. This works great in spots that normally turn into still water or runoff and oversaturate the wrong places of your property. An irrigation system is vital for keeping your landscape healthy throughout the year. Give us a call today and we'll schedule an estimate. Thank you for your business; our customers satisfaction is our number one priority.